Kristi Seaton joined the Polymath Project team in early 2008. This project spoke to her loudly when she reflected on her own educational experiences, which left her unsatisfied. 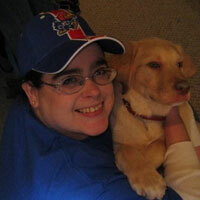 Kristi has a Bachelors of Science in Telecommunications Management from DeVry University. She finished her degree after majoring in Honor’s Philosophy, English, Business Management and taking classes in Biblical Wisdom and Poetic Literature. Kristi is employed as a lab technician at Stower's Institute for Medical Research, where she enjoys frequent lecture opportunities by some of the world's leading geneticists and cancer researchers. Ms. Seaton enjoys playing her piano, reading across a wide range of disciplines, and frequent journaling. Kristi has been published internationally both on the Internet and in print. She is working on a current piece of literature under the guidance of a mentor. Kristi also enjoys active membership in her church, teaching the fifth and sixth graders while often encouraging an open dialog about the reconciliation of faith and science. It is Kristi's dream to see Project Polymath come to brick and mortar fruition: that she will be able to write letters of recommendation for the very children she teaches now in her circle of influence.